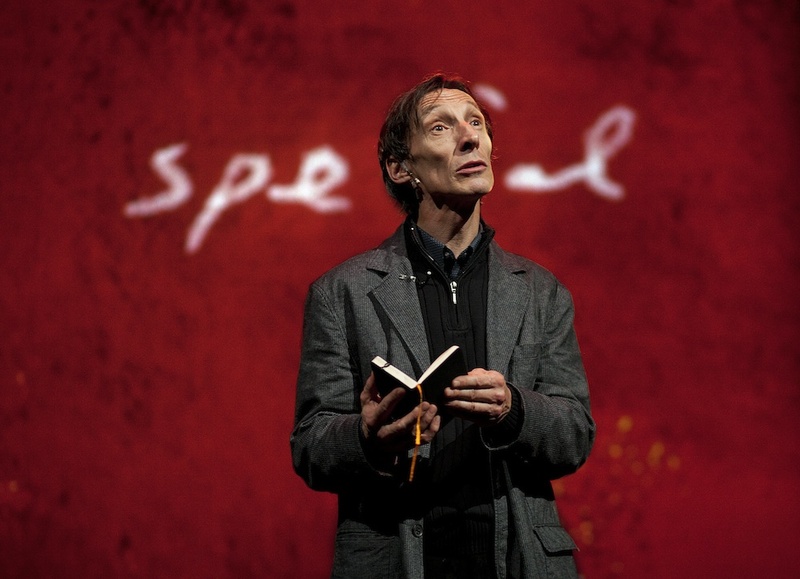 Julian Richings as John Berger. Photo by John Lauener. When I first heard what the production is about, it set my geeky heart aflutter. In 1997, painter/filmmaker John Christie asked poet/art critic and Booker Prize-winning novelist John Berger (Ways of Seeing) about ideas for their next project. Berger replied, “Just send a colour.” Christie then sent a painted square of cadmium red, and thus began a discussion about the nature of colour through an exchange of letters. 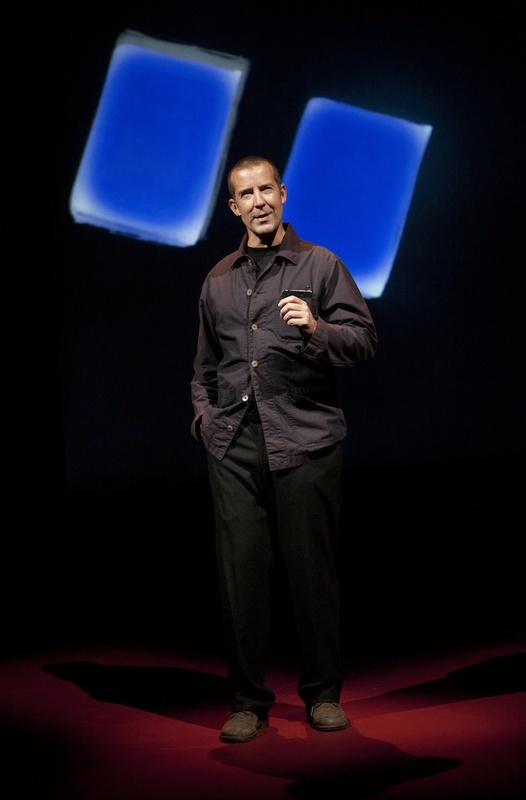 Three years later, their correspondence was made into a book, which was then adapted into a BBC radio play in 2002 with original music created by Gavin Bryars (The Sinking of the Titanic). Art of Time Ensemble’s production brings this correspondence to life, led by the direction of Daniel Brooks (House, Possible Worlds) and musical direction of Art of Time Artistic Director Andrew Burashko. Berger (Julian Richings) and Christie (John Fitzgerald Jay) meditate on colours, evoking metaphors in art, music and other remarkable connections. Bruce Alcock’s set and imagery creates a world of colour through an animated backdrop that enhances the exchange of thoughts on stage. Music, lighting and animation fuse with text to create a theatrical experience for all of the senses. John Fitzgerald Jay as John Christie. Photo by John Lauener. I love the concept behind this production. The correspondence between Berger and Christie is itself fascinating — I remember watching Red at Canadian Stage a few years ago, and being utterly captivated by the exploration of Rothko’s use of colour, and in this case, overwhelming experiences of colour, to create a moment. Personally, I’d love to see that production again; I was completely caught up in the emotion and, despite not having an art background myself, I was inspired by the idea of how an artist’s work with a particular colour can resonate so much with the viewer. I loved Red‘s glimpse into Rothko’s work, and I’m excited to see Berger and Christie’s exploration of colour in Cadmium Red. Even more exciting for me is that in this show, Art of Time takes it beyond straightforward storytelling — the production also expresses Berger and Christie’s correspondence through classical music, adding yet another layer of interpretation that will likely enrich the experience. I remember hearing of this when it was first produced, and not having gotten around to watching it then. I’m definitely not missing out this year, and I’m looking forward to seeing how it turns out. I Send You This Cadmium Red runs 60 minutes without an intermission, and is on stage from April 9 to 12, 2014 at the Enwave Theatre (231 Queens Quay West). Tickets are from $25 to $59 are available online at harbourfrontcentre.com, by phone at 416.973.4000 or in-person at the box office. For more information on Art of Time Ensemble, see ArtofTimeEnsemble.com and follow them on Facebook and Twitter at @ArtofTime. This entry was posted in Non-Book Review Posts and tagged Art, literature, music, theatre by Jaclyn. Bookmark the permalink.